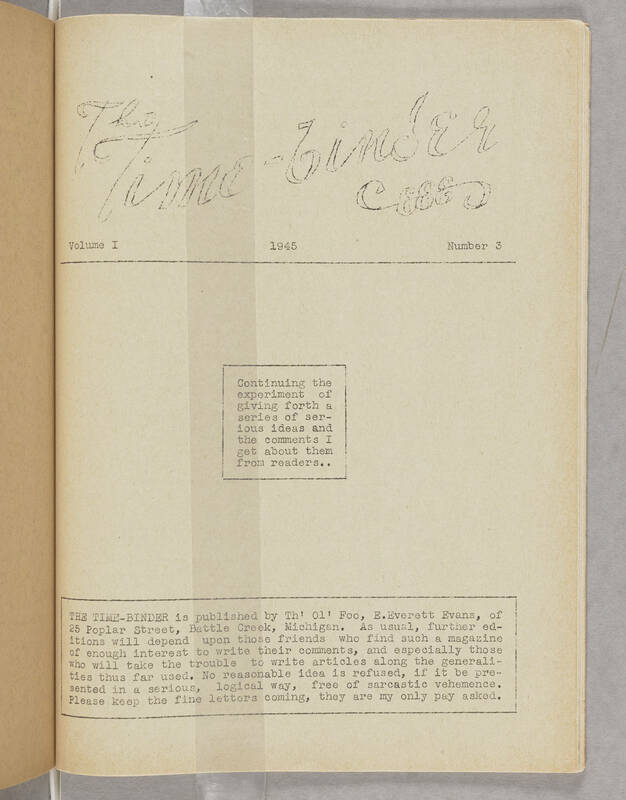 The Time-bender Volume I 1945 Number 3 Continuing the experiment of giving forth a series of serious ideas and the comments I get about them from readers.. THE TIME-BENDER is published by Th' Ol' Foo, E.Everett Evans, of 25 Poplar Street, Battle Creek, Michigan. As usual, further editions will depend on those friends who find such a magazine of enough interest to write their comments, and especially those who will take the trouble to write articles along the generalities thus far used. No reasonable idea is refused, if it be presented in a serious, logical way, free of sarcastic vehemence. Please keep the fine letters coming, they are my only pay asked.